Mariam Pallathucheril is a summer research fellow at CoProcure and a current MPA/MPP candidate at Columbia University (SIPA) and the Hertie School of Governance concentrating in Economic Policy and Technology. She received her Bachelor’s degree in Economics and Government from Georgetown University. Procurement is the way governments purchase goods and services. Policies regulate purchasing, but individuals carry out the work. Who manages purchasing decisions, how this work is structured within the organization, and the cultural environment in which individuals operate all affect the experience and outcomes of the process. From over 200 interviews with public procurement stakeholders, we understand that the “people” problems of procurement are often the most painful and hardest to change. We distilled what we heard into three types of people problems: negative internal government perceptions of procurement; risk-averse organizational culture; and pressures on procurement teams. These factors contribute to the overall slow pace and complexity of public procurement. Government staff have different (and often negative) perceptions about procurement within the organization. There are many participants in government purchasing. Generally, there are government department staff who have a need and must make a purchase. The need typically exists from within one department, but can span a few other departments, which means more stakeholders with more requirements. (For instance, if the purchase is related to technology, the local government’s Department of Technology will likely play a role in determining requirements, engaging vendors, evaluating bids, etc.) Procurement staff typically work to support government colleagues in making purchases, but the way(s) in which procurement staff interact with their government colleagues can vary widely from jurisdiction to jurisdiction and even within a single jurisdiction. The City Attorney’s office also influences procurement decisions, since purchasing requires that government enters into legal agreements with vendors. Negative perceptions between government staff and buyers undermine trust. In our interviews, we noticed that government staff from other departments typically have negative perceptions of procurement and legal colleagues. Government staff told us: “Procurement is always too ready to say no,” and “the people managing the process are always very conservative.” According to some of our interviewees, the perception that procurement is always ready to say no actually creates a negative feedback loop. Government staff, expecting that procurement colleagues will reject their work and cause delays, avoid collaborating with procurement officers. Instead, they attempt to bypass the process or wait until the final moment to bring procurement colleagues in the process. Procurement staff are aware of this perception and its consequences: “Then [towards the end of the process] it’s too late – we have to say no, because they [the other department] did everything wrong. If they’d come to us earlier, we would have been able to help them do it right the first time around. But now they have to start over.” Negative perceptions about the roles of procurement prohibit effective collaboration and cause delays in purchasing. For better or for worse, City Attorneys have a lot of power over the procurement process. Finally, even when procurement officials and government staff don’t get along, they do agree that the City Attorney’s role heavily influences the procurement process. As one City Manager told us: “We’ve been wanting to try a few new things, and our procurement officer is on board, but our City Attorney is so conservative.” Procurement officials and government executives that had strong positive relationships with their legal colleagues shared that this relationship had allowed them to improve the speed and efficiency of procurement. Public procurement officers operate in an already notoriously risk-averse cultural environment. Interviewees shared that, as a public employee, trying something new won’t get you a promotion or a raise – but it may get you, your Department, and your executive leadership in trouble. Since procurement is directly responsible for spending public funds, procurement staff are especially sensitive to risk. Procurement officers described a sense that failure is more well-publicized than successes, and “nobody wants to be in the paper for wasting taxpayer dollars.” Deviation from the status-quo makes protests from vendors more likely. As a result, decisions by individual procurement stakeholders tend to bias away from things that staff think may expose the organization – or themselves – to greater risk. One major theme that emerged from our research is that procurement staff are being asked to do more with less. At a meta-level, we heard about the consequences of massive budget and spending cuts coupled with the public sector ‘silver tsunami’ of retirements. In many local governments, procurement staff have retired and not been replaced. Procurement officers expressed having to wear multiple hats and “fighting fires,” leaving little time or opportunity for more proactive and strategic work. The required risk “recalculation” is: the riskiest option is the status quo. 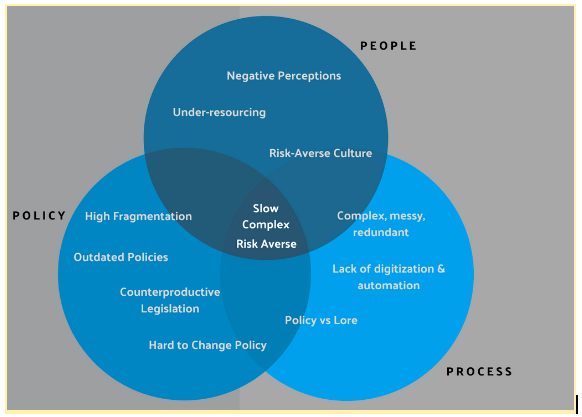 Even though the status quo is perceived as “safe,” the current process yields high failure rates, especially when it comes to technology. Over 94% of tech procurement projects over $10M fail. The challenge is that the current process produces bad outcomes, but the personal risk associated with changing the process is too high despite the poor results at the organizational level. Government staff must socialize to leaders and colleagues that, when it comes to purchasing, the riskiest option is the status quo. Elected leaders must provide the political cover for risk-taking. For most electeds, procurement reform is not high on the agenda. Positive procurement stories don’t exactly motivate voters or occupy prime headline real-estate. In terms of return on investment, electeds can and should provide essential political cover for bureaucrats wishing to make small, more creative changes. De-risk purchases by making them smaller, through dedicated programs, and through more active sharing with other governments. A handful of innovators have been able to de-risk changes to purchasing in a few ways. For instance, cities are starting to work with startup vendors through cohort-based programs like Startup in Residence. Others are breaking down large projects (with correspondingly large odds of failure) into smaller pieces through modular contracting. Additionally, more departments have embraced tools like CityMart and UrbanLeap, which allow cities to benefit from sharing the results of experiments or more creative approaches with each other. Seize opportunities for training and collaboration. Invest in onboarding and training. Most government staff we spoke with, including procurement staff, shared that they were self-taught when it came to making purchases. “When I joined the City, there was no orientation to how to make a purchase. You just learn it by having to go through it.” Providing an orientation to purchasing for local government employees with purchasing staff might help improve internal perceptions across purchasing and non-purchasing functions. Clarifying the role of procurement for the organization, when to approach procurement and why might also help build trust in the organization. Similarly, many procurement staff don’t have purchasing backgrounds and must learn from available “stale” and “old-school” trainings and through personal contacts. Staff that judged themselves to be effective often credited their success to the strength of their networks. Finding ways to strengthen these trainings and networks earlier, and on a more ongoing basis, may help purchasers access knowledge, tools, and case studies for new types of purchases. Create feedback loops: One final challenge is that procurement organizations are often incentivized around compliance and cost, but not around customer service and the quality of outcomes. Once a purchase occurs and a contract is signed, there is limited capacity to follow-up and evaluate feedback from government staff and residents. Unfortunately, this lack of a feedback loop makes it hard to iterate on purchasing processes and to find and punish bad vendor actors. Some startups like Govlaunch and Marketplace.city offer government staff a platform for reviewing products, but governments need better infrastructure for running collaborative post-portems on purchases, tracking vendor performance, and iterating on processes. There’s a lot of tough work to do in this category of pain and potential solutions. Read on as we explore our final category of pain: process.